There are New Zealand native shrubs throughout all my garden, but the Hen House Gardens has quite a collection of foliage evergreens. In the early days, when this garden was cleared, I tried to group the natives together in one area. There was, of course, a regulation red flax - the signature plant of my early gardening days. Gradually larger green varieties were added. Now my much loved Phormiums (flaxes) are very evident. I'll do anything not to disturb the flaxes. The Phormium Cookianum below has caused three re-routings of the main Hen-House Garden path. Better to shift the path than the plant! Phormiums possibly should come with a 'Plant Warning' on their labels! Some just grow too big for a mixed border, and after some years others can become just too messy. One of the originals in the Hen House Garden had to be removed after the winter snow storm flattened it in 2006. A smaller hybrid was planted in its place. 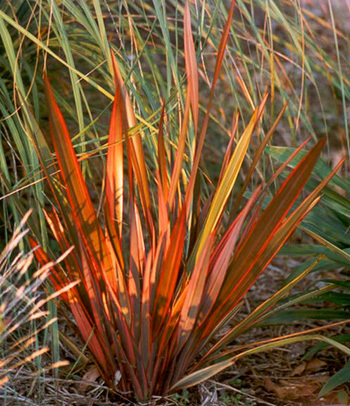 In late autumn and winter the New Zealand hybrid flaxes provide warm glowing colours, when other plants are out of action. Pseudopanax (five fingers) grow well in this sheltered garden. You'll also find the smaller texture shrubs like Corokias and Coprosmas, plus a quartet of special Olearias with coloured little daisy flowers. Hebes grow here too, but they can get rather leggy, preferring more sun. I've also planted different varieties of Pittosporums, remembering to keep them well-pruned so the paths are passable. A couple of the early ones outgrew their positions and had to be sawn down, but this opened up the interior of the garden, letting in light for the rugosa roses. Oops. 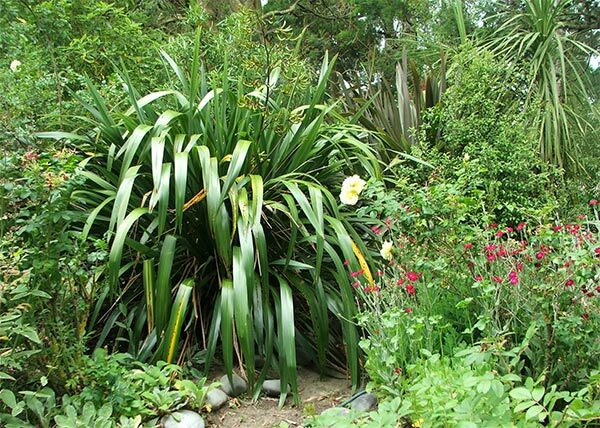 How did they sneak into a New Zealand Native garden? In the early days, whenever I saw little red flaxes in bargain bins or on sale tables I'd buy them all. They'd often start life in pots, and after a few years I'd plant them into the garden. In they'd go, often far too near the paths, wherever there was a space. Just for the record, this is an archive photograph of one of the original Hen-House red flaxes which didn't last the distance. It did grow nicely tall, but its newer leaves reverted to dull olive green. And - yes - someone planted it far too close to the path.